I’m Lie Berty Handy, 60 years old, from Surabaya, Indonesia. In 2014, I was diagnosed with gastrointestinal stromal tumor and took minimally invasive treatments at St. Stamford Modern Cancer Hospital Guangzhou which include interventional therapy, cryotherapy, microwave ablation, biological natural therapy and photodynamic therapy. Now, my gastric tumor has shrunk from 14 cm to 9cm, and metastatic liver tumor has gone. I’m in good and stable condition now. I especially love playing tennis that I must play three times a week. One day in September 2014, I played tennis as usual. Suddenly, I felt abodmen pain and bloated which made me so worried as this never happened to me before. Without hesitation, I went to have check-up at local hospital. Ultrasound and CT scan showed there was a lump in my stomach, doctors ruling out stomach cancer. I refused to be hospitalized as advised. My aunt suggested to visit Surabaya Office of St. Stamford Modern Cancer Hospital Guangzhou for a free consultation. She used to have liver cancer and after one course of minimally invasive treatment at this hospital, she became cancer free and got good results. I came to the office and asked the doctor whether my disease can be treated or not. He answered me “yes”, so I was determined to have a try at this hospital in Guangzhou. In Oct. 2014, I arrived at St. Stamford Modern Cancer Hospital Guangzhou. After thorough check-up, it confirmed that the lump was gastrointestinal stromal tumor, 14 cm big. Upon hearing that, I was scared and worried, but with the encouragement from my families, I accepted it calmly. Multidisciplinary team customized comprehensive minimally invasive treatments for me and immediate treatment followed. 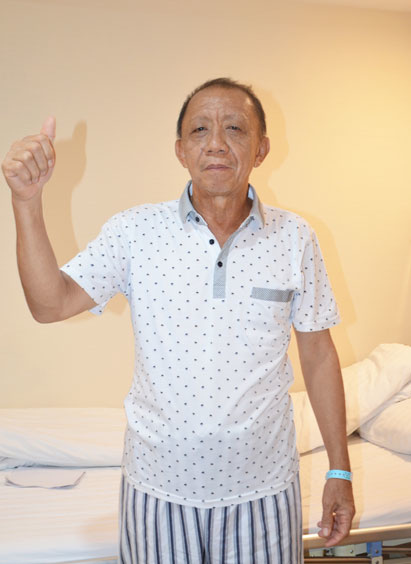 The first treatment was interventional therapy which I find impressive as the gastric tumor instantly reduced. In Feb. 2016, I was amazed after cryotherapy and found out the tumor shrank by 5 cm. In addition, there was a metastastic tumor in my liver before but it has disappeared. It’s my sixth time to be here for treatment. Previously, I came here every 3 months; now, every half year. So far, I have received inteventional therapy, cryotherapy, microwave ablation, natural therapy and photodynamic therapy. They are really minimally invasive treatments without any side effects. My tumor has shrunk and symptoms have disappeared. Everytime I finish the treatments and go back to Indonesia, I get my normal life, get back to work, I play tennis as I usually do. My friends say I don’t look like a cancer patient at all. What I hope now is that this good news continues and that the gastric tumor disappears soon completely. Compared with hospitals in Indonesia, treatment techniques here are far more advanced. For one, there is a medical team to take care of me instead of only one medical staff. I am so greatful to my attendant Dr. Lin Jing who is very responsible and nice. Aside from that, services provided here are also excellent. The hospital routinely organizes activities for patients. Part of the activities is the city tour for the patients and companions to go out and see the nature and beauty of Guangzhou, a perfect getaway for relaxation and a time to enjoy. My experience in Pearl River Cruise was superb. I was able to meet other patients as well from different countries. I love cooking Indonesian food and during my hospitalization, I am free to prepare meals that I want because a kitchen is available in the hospital for patients. I want to tell other cancer patients to be strong and keep taking treatment… and never give up!